With the National Football League holding the 51st Super Bowl in Houston, Texas, we thought it we be an opportune time to take a look at the history of pro hockey in Houston. 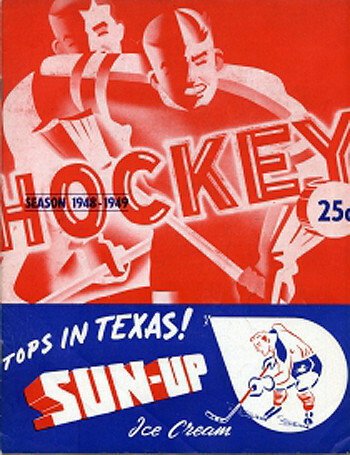 Professional hockey in Houston begins in 1946 with the awarding of a franchise to the city by the United States Hockey League. The club was named the Houston Skippers in recognition of the skippers of the boats along the Houston Ship Channel. Their home arena was the Sam Houston Coliseum and they began play in October of 1946. They were led in scoring by one Morden "Ducky" Skinner who scored 23 goals and 64 points in 57 games. They found life as an expansion team to be typically difficult and finished last in the eight team league with a 14-32-14 record. For the 1947-48 season, the franchise changed their name to the Houston Huskies and hired former Montreal Canadiens player Toe Blake as their head coach. In a dramatic turnaround, the Huskies won the Southern Division with a league best 75 points from a 36-27-3 record. In the playoffs, they defeated the Kansas City Pla-Mors in seven games which earned them a bye into the finals where they defeated the Minneapolis Millers 3 games to 2 to win the Paul W. Loudon Trophy as league champions. George "Bus" Agar was the leading scorer that season for Houston with 43 goals and 69 assists for 112 points in 66 games to lead not only the Huskies, but the entire USHL in scoring by a 21 point margin. For 1948-49, it was right back to last place for the Huskies, with only Les Hickey's 32 goals worth noting. Things all went wrong for the Huskies in June of 1949 when, along with the Dallas Texans and Fort Worth Rangers, they tried to form a Texas Hockey League. They were unable to get firm commitments for dates and, as a result, the Coliseum cancelled their contract with the team and the club ceased operations after three seasons, one as the Skippers and two as the Huskies. 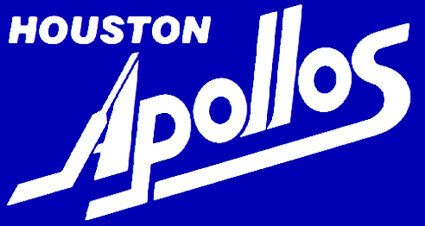 Houston then went without pro hockey for 16 seasons until the arrival of the Houston Apollos for the 1965-66 season. The team played in the Central Professional Hockey League and were originally a farm team of the Montreal Canadiens, no doubt giving their French-Canadian prospects a case of culture shock on their arrival in the deep south! The club was formed during the United States effort to get men to the moon with the Apollo program, and with NASA Mission Control being based in Houston, the team name and logo clearly reflected the excitement of the times. Andre Boudrias led the 1965-66 team with 27 goals and 73 points in 70 games leading the team before going on to play 662 games in the NHL and another 140 in the World Hockey Association. The Apollos finished fifth out of six teams with a respectable record of 27-32-11 but out of the playoffs. The team rose to third place in 1966-67 with 74 points from a 32-28-10 mark but lost in six games in the first round of the playoffs. Bill Inglis with 33 goals led Boudrias for the team lead in scoring 67 to 64. 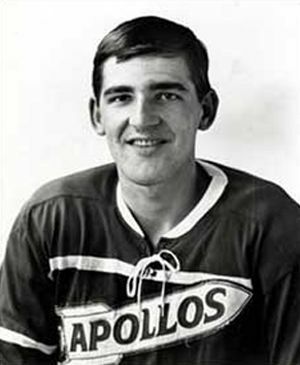 Future NHL players of note for the Apollos that season were Carol Vadnais and future Hockey Hall of Famers Jacques Lemaire, Serge Savard, Pat Quinn and Rogie Vachon. The Apollos slipped back to last in the Sourthern Division at 28-31-11 in 1967-68 and were led by Jude Drouin with 22 goals and 60 points. For 1968-69, the league shortened its name to the Central Hockey League and Ernie Hicke was the club leader in scoring with 29 goals and 72 points in 72 games. Players of note that season were future Hall of Famers Guy Lapointe and Tony Esposito. 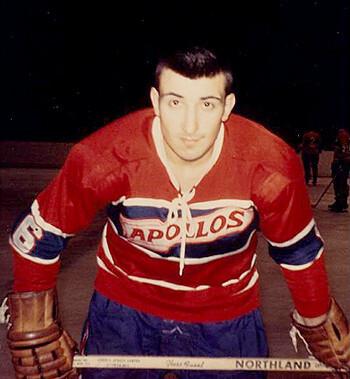 On the ice, the team had their best season with 80 points after a 34-26-12 season, but it proved to be the final season for the Apollos, as the Canadiens moved their minor league franchise to home base in Montreal to cut back on travel costs and poor choice of game dates and lack of practice time at the Sam Houston Coliseum. After four seasons without a team, Houston was back on the map when the world of professional hockey changed dramatically in 1972 with the arrival of the WHA. In 1966-67, the NHL consisted of just six teams. By 1972-73, the league had grown to 16 clubs and the new WHA was looking for homes for its inaugural class of 12 teams. 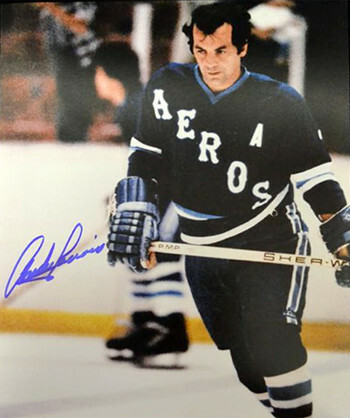 Originally slated to play in Dayton, Ohio, but never got off the ground due to the lack of a suitable arena, so owner Paul Deneau moved his team to Texas, where they were known as the Houston Aeros. 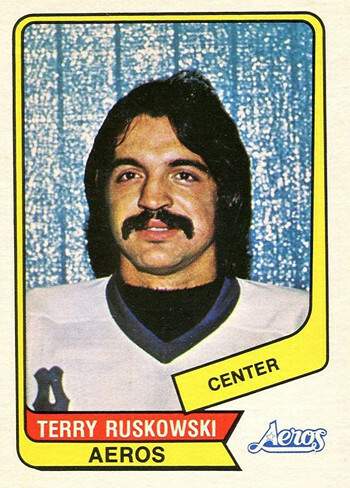 Houston, with a cast of journeymen players with an absolute minimum of NHL experience, finished second in the Western Division in 1972-73 with 82 points, winning 39, losing 35 with 4 ties. The won their first round playoff series over the Los Angeles Sharks but were then swept by the Winnipeg Jets in 4. The club lacked star power, having been led in scoring by Gord Lebossiere's 36 goals and 96 points in 77 games, which placed him 9th overall in the league. Then, having already retired from the NHL's Detroit Red Wings, six time NHL scoring leader, six time NHL MVP, four time Stanley Cup champion and already a member of the Hockey Hall of Fame, 45 year old Gordie Howe was enticed back onto the ice for a chance to play with his sons Mark and Marty Howe in a colossal coup for the Aeros and the WHA. At the time, the NHL rules prohibited the NHL from signing players under the age of 20, but the WHA, seeking a competitive advantage for new talent, had no such problems in signing the 19 year old Marty and 18 year old Mark to a pair of $400,000 contracts, especially if the package included one of the most recognizable names in the game in the form of their legendary father. The move paid immediate dividends for the Aeros, as they won the first of four consecutive Western Division titles with a 48-25-5 record for 101 points. Houston then defeated the Jets, survived a fight filled series against the Minnesota Fighting Saints and then became Avco Cup champions with a four game sweep of the Chicago Cougars. Gordie Howe led the team in scoring with 31 goals and 69 points for 100 points, good for third in the league and one of only three players to hit the century mark on his way to league MVP honors. 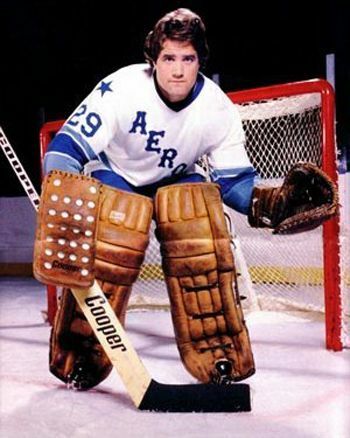 Goaltender Don McLeod led the WHA with a 2.56 goals against average and Mark Howe was named Rookie of the Year to add to the Aeros honors in 1974. 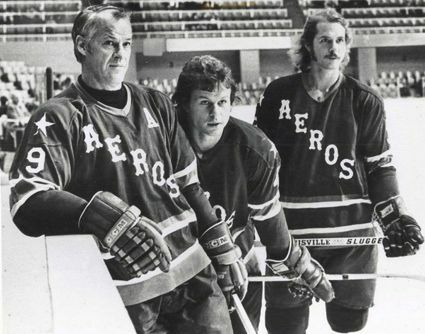 The Aeros again had the league's best record in 1974-75 with a 53-25 record for 106 points. 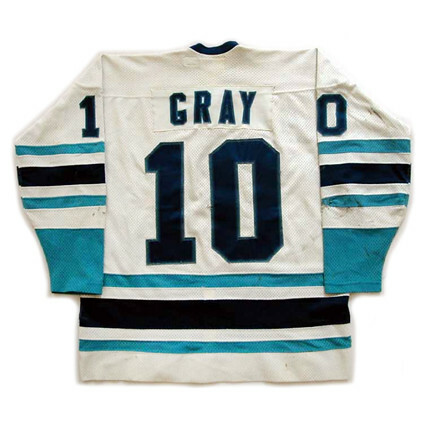 They then blitzed the playoffs, defeating the Cleveland Crusaders, San Diego Mariners and Quebec Nordiques with a 12-1 record, with their only blemish being a lone loss to Cleveland as they won their second consecutive WHA championship. Goaltender Ron Grahame won the best goaltender award with a league best 3.03 goals against average with teammate Wayne Rutledge third at 3.24. Grahame was also named the playoff MVP. Larry Lund led the team with 108 points for fifth in the league, while Gordie Howe was eighth with 99 points. While much of the rest of the WHA was rather chaotic, with teams folding, relocating or being added as expansion teams, the Aeros steadily marched on, led by Gordie Howe and goaltender Rutledge. They captured their third consecutive division title in 1975-76, with a league leading 53-27 record for 106 points, the third consecutive time finishing first overall in the regular season. Gordie Howe was tenth in the points chase with 32 goals and 70 assists for 102 points in the wide open WHA while Rutledge was third among goaltenders with a 3.17 goals against average. 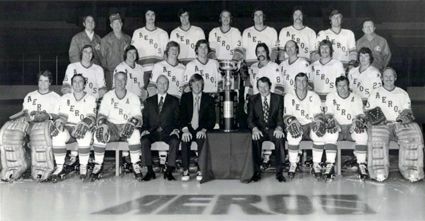 The Aeros again made it to the Avco Cup Finals after defeating San Diego in six games and the New England Whalers in seven before being denied a third straight championship after dropping four straight to Winnipeg. 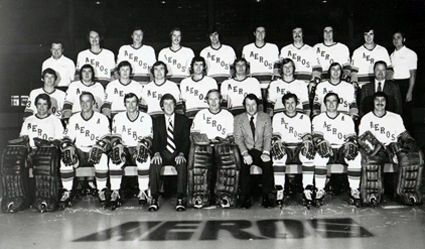 In 1976-77, the Aeros once again had the best record in the WHA at 50-24-6 for 106 points to win the Western Division for the fourth straight time. With the ageless Gordie Howe limited to 62 of the Aeros 80 games, Terry Ruskowski led the club in scoring with 84 points. Grahame was tops among goaltenders with a 2.74 goals against average with Rutledge in fourth at 3.15. Houston won their first round playoff series 4-1 over the Edmonton Oilers, but were defeated for the second year running by Winnipeg, this time in six games. With John Ziegler now Commissioner of the NHL, talks began about a merger of the WHA and the NHL. Houston, along with five other WHA clubs, applied for entry into the NHL, but the NHL owners voted the proposal down. Additionally, with their four year contracts having run their course, the Howes left the Aeros for the Whalers for 1977-78. The league was down to a single, eight team division and the Aeros finished in third place after going 42-34-4 for 88 points. 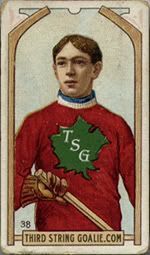 The team was led in scoring by the offensive talents of Andre Lacroix, who netted 36 goals and 113 points for sixth in the league, far outdistancing Morris Lukowich's 75, despite Lukowich leading the team in goals with 40. 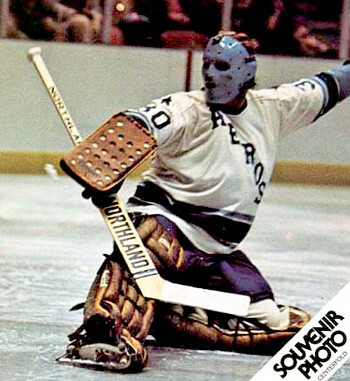 Houston lost to the Quebec Nordiques in the opening round of the playoffs in six games, which brought the curtain down on one of the WHA's most successful franchises after six seasons of play. Merger talks had resumed with the NHL, but various factors worked against the Aeros. NHL owners would not agree to allow in six teams, and the WHA insisted that all three Canadian teams be part of any agreement, leaving the choice for the fourth team a decision between Houston and New England. The Aeros current owner, Ken Schnitzer, attempted to enlist the support of the Boston Bruins over the nearby Whalers in Hartford, only to discover Jeremy Jacobs wanted nothing to do with any WHA teams joining the NHL. Additionally, Ziegler was cool to the idea of another southern team in the NHL light of the issues faced by the already relocated Kansas City Scouts and California Golden Seals and the struggling Atlanta Flames. With no merger happening at all for 1978-79, and no likely future plans to include Houston, Schnitzer attempted to purchase the NHL's Cleveland Barons and relocate them to Houston. 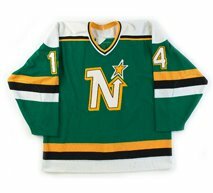 When Cleveland merged with the Minnesota North Stars and the NHL uninterested in admitting the Aeros, Schnitzer had run out of options to join the NHL and folded the franchise rather than carry on in the WHA. When the NHL allowed four of the remaining six WHA teams into the NHL for the 1979-80 season, Houston became the only WHA champion that did not eventually join the NHL. 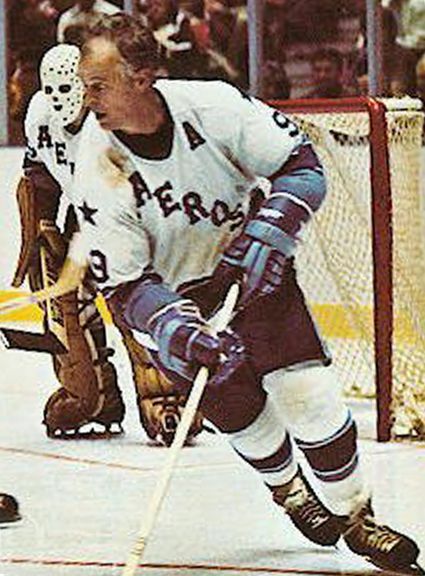 Lund was the team's all-time leading scorer with 426 points, having played in all six of the Aeros seasons, followed by Gordie Howe, with 369 in four seasons. Frank Hughes and Lund tied for the most goals with 149. 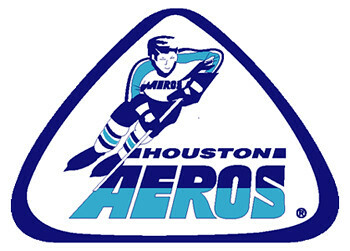 With the Aeros having folded, the Houston Apollos of the Central Hockey League were revived for the 1979-80 season. This new version of the Apollos finished in sixth place out of nine teams in the CHL with a 32-38-10 record and were eliminated in the first round of the playoffs. Having been used to top flight hockey with star players, regular division titles and championships, the appetite for minor league hockey was not there in Houston, and the Apollos folded after 33 games of the 1980-81 season. 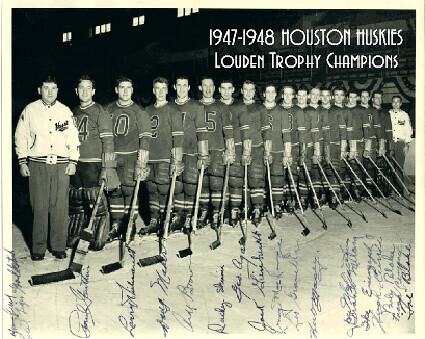 Despite only having been around a year and a half, the second incarnation of the Apollos saw several NHLers in their lineup, including Charlie Huddy, Battleship Kelly, Garnet "Ace" Bailey, Barry Gibbs, Hanson Brother Steve Carlson and future Hall of Famer Mark Messier, who played four games in Houston, the only minor league games of his entire career, as punishment for missing a flight to St. Louis by Edmonton Oilers head coach Glen Sather! A long 13 year gap awaited the fans in Houston before hockey would return in 1994-95 in the form of the new Houston Aeros of the International Hockey League. 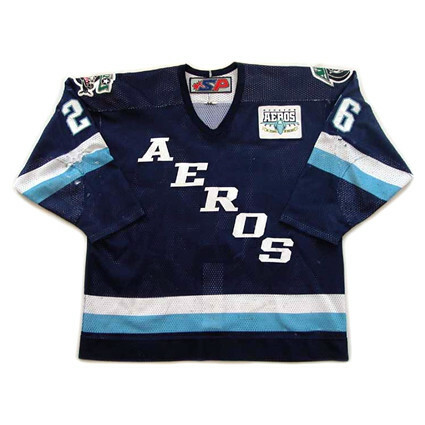 Named after the WHA franchise, the new Aeros had an entirely different identity package, featuring new colors and an excellent new logo, with jerseys sporting a military theme. Five seasons earlier, the IHL consisted of nine teams, but an aggressive expansion program saw them double in size, which included adding four teams for the 1994-95 season, including the Aeros. They had a winning record their first season at 38-35 with 8 overtime losses. After missing the playoffs in 1995-96, they rebounded with a fine 44-30-8 record in 1996-97, which saw them go three playoff rounds before being eliminated. A fine 50 win season followed in 1997-98, but the luster was lost following a first round playoff elimination. The following season the Aeros established a franchise high with 54 wins on their way to the Southwest Division title. They then defeated the Long Beach Ice Dogs, the Chicago Wolves and the Orlando Solar Bears, with each series going the maximum number of games, to win the Turner Cup as IHL champions. After two more seasons of play, the IHL was in trouble, as they had expanded into many NHL markets, such as Chicago, Detroit and the Los Angeles area while just 4 of 18 teams had affiliations with NHL teams in 1997-98. The loss of subsidized salaries and increasing travel costs, along with the NHL expanding into some of the IHL markets was too much for the league to survive, and the IHL ceased operations after the 2000-01 season. The demise of the IHL did not mean the end of hockey in Houston however, as six IHL clubs were granted admission to the AHL, with the Aeros being among them. 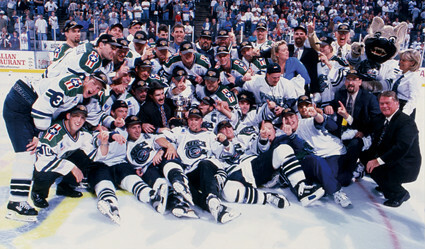 After seven independent seasons in the IHL, Houston became the top minor league affiliate of the Minnesota Wild for their first season in the AHL of 2001-02. 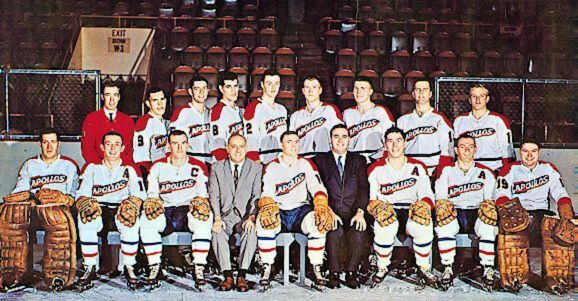 Their second season in the AHL saw the club win the West Division with a 47-23-7-3 mark and defeat the Milwaukee Admirals, Norfolk Admirals, Grand Rapids Griffins and Hamilton Bulldogs to win the Calder Cup, their second championship in five seasons. In 2003-04 the Aeros finished below .500 ending a seven year run of winning records. The franchise would rebound with a 40 win season in 2004-05 followed by a 50 win season in 2005-06. The Aeros would play seven more seasons in Houston, including a return to the Calder Cup Finals in 2010-11, falling in six games to the Binghamton Senators. The franchise was purchased by the parent company of the Wild before the 2004-05 season, and when they could not come to favorable terms with the Toyota Center after the 2012-13 season, the Wild relocated the team to Des Moines, Iowa, 3 1/2 hours down the interstate from the Wild's home of St. Paul, Minnesota, thus ending the Aeros run after 19 seasons, by far the longest tenure of any hockey team in Houston. 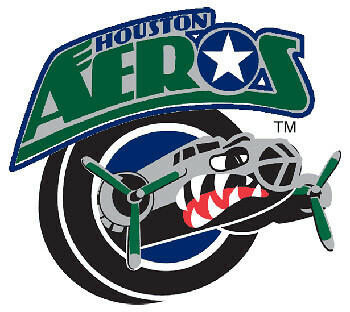 Since the relocation of the Aeros, no new franchise has been located in Houston, leaving it by far the largest city by population without a professional hockey team in the United States and Canada. 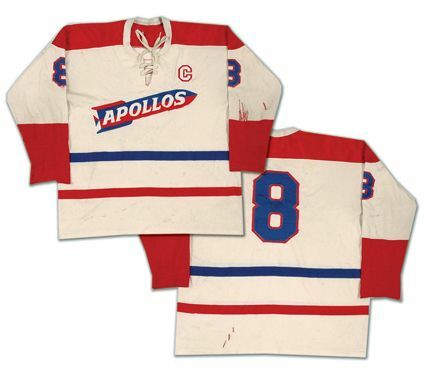 Today's featured Apollos jersey is a 1968-69 Houston Apollos Bob Ellett jersey, a beautiful sweater clearly based on the home jersey of the parent Canadiens, as seen in the red shoulders and cuffs, blue numbers outlined in red and the lace-up collar, all traits shared with Montreal's sweaters. 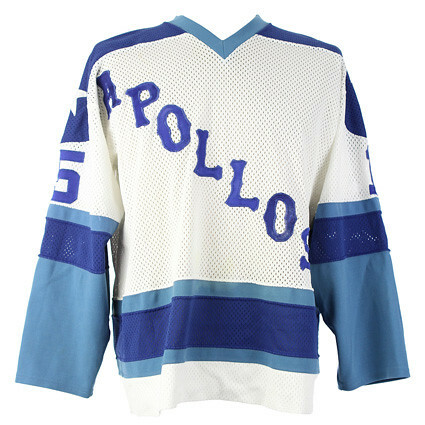 While the Canadiens had a red stripe over a blue stripe around the waist, the Apollos had the color order reversed and the stripes much farther apart. What really makes this jersey stand out is the fantastic crest of the two-color rocket with contrasting fins which contains the name "Apollos" in beautifully chain-stitched lettering. Simply gorgeous! 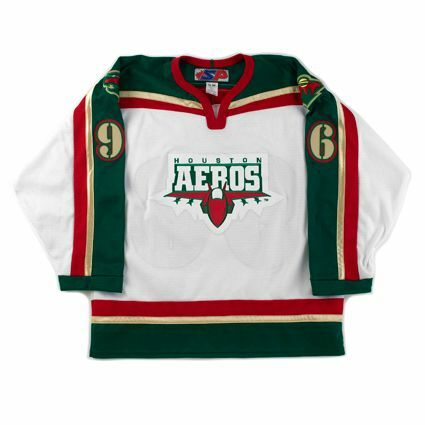 Today's featured Aeros jersey is a 1973-74 Houston Aeros Gordie Howe jersey. This classic jersey combines a vintage font running diagonally across the front in the classic manner paired with a simple striping pattern topped off with a star on each shoulder, proving less is more when it comes to an effective and timeless hockey jersey. 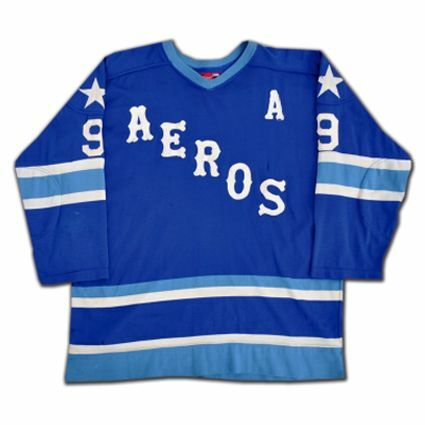 We have seen a number of different variations for Gordie Howe Aeros jerseys, including his full name on the back with serifed letters as seen on today's featured jersey, "G. HOWE", also using the same serifed letters, and finally his full name on the back with standard, sans-serif block letters. 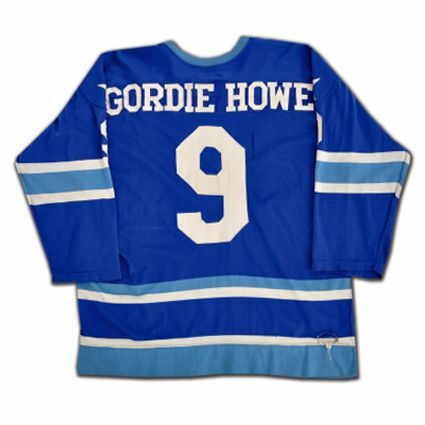 Research indicates that the "G. Howe" variation was from the pre-season of Howe's first year with Houston, meaning all genuine Howe Aeros regular season game worn jerseys should have his full name on the back. 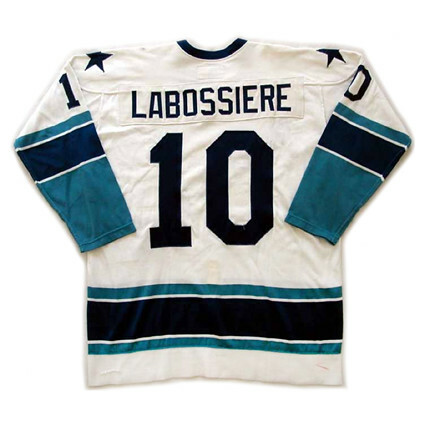 Bonus jersey: Today's bonus Aeros jersey is a 1974-75 Houston Aeros Gord Labossiere jersey from the franchise's original leading scorer in 1972-73. 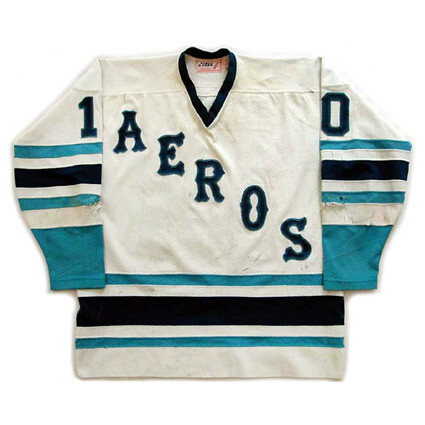 The Aeros home jerseys had a different striping pattern than their blue road jerseys but always matched the name and number fonts of the road jerseys. This style was used from 1973-74 to 1976-77. 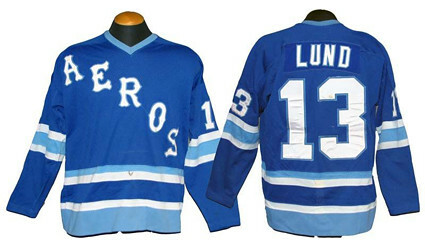 Extra bonus jersey: Today's extra bonus Aeros jersey is a 1977-78 Houston Aeros Larry Lund jersey from the franchise's final season when the changed the striping pattern of teh white jerseys to wider stripes to more closely align with the look of the home blue jerseys. Additionally, the cresting, names and numbers all became two colors. 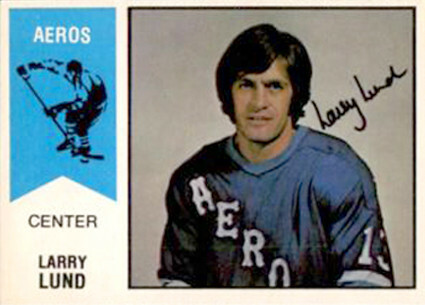 Extra extra bonus jersey: Today's extra extra bonus Aeros jersey is a 1976-77 Houston Aeros Larry Lund jersey from the franchise's all time leading scorer. 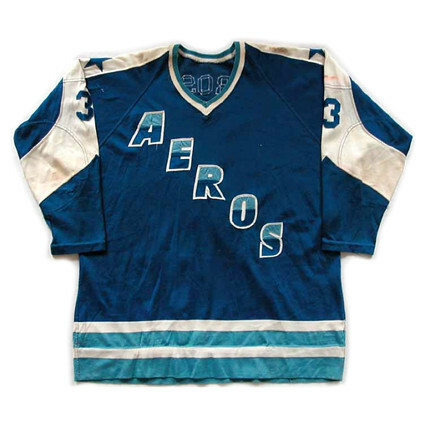 This jersey can be identified as from the latter stages of the Aeros run in the WHA by the simple block letters for the name on the back as opposed to the serifed letters from the team's early days. 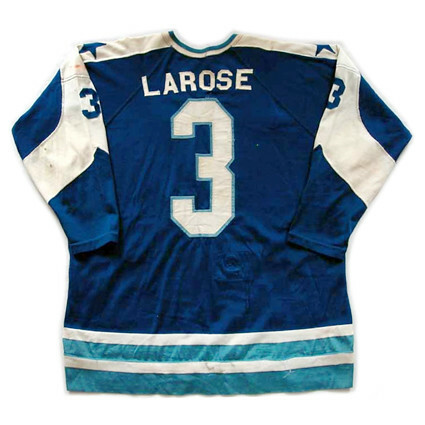 Extra extra extra bonus jersey: Today's extra extra extra bonus Aeros jersey is a 1972-73 Houston Aeros Ray LaRose jersey from the Aeros inaugural season. This style, with the two-tone Aeros cresting in a modern font also differs from their subsequent jerseys by the white stripes that run down the sleeves and around the arms near the wrists. 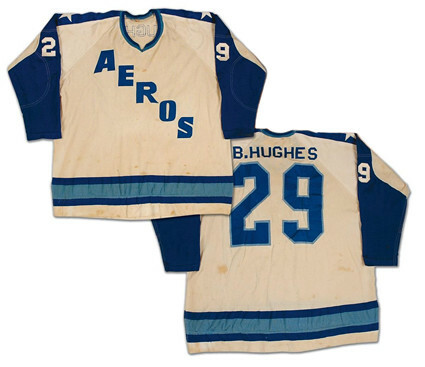 Extra extra extra extra bonus jersey: Today's extra extra extra extra bonus Aeros jersey is a 1972-73 Houston Aeros Bill Hughes jersey from the Aeros inaugural season. This home jersey is more plain than their road jerseys, opting for single color lettering as opposed to the two color letters outlined in white of the more effective road jersey. Also worth noting is the difference in the sleeve treatment, as the home whites do not have white cuffs to mirror the blue cuffs of the road jersey. 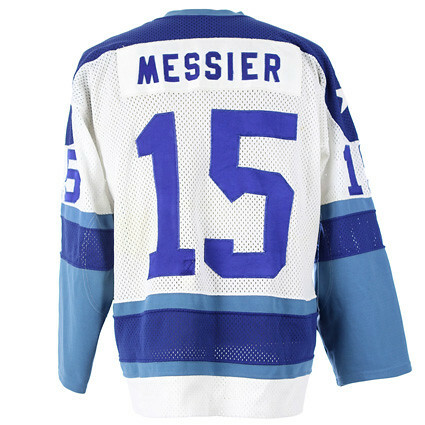 Today's featured second Apollos jersey is a 1979-80 Houston Apollos Mark Messier jersey from the short-lived revival of the Apollos after the demise of the original Aeros of the WHA. 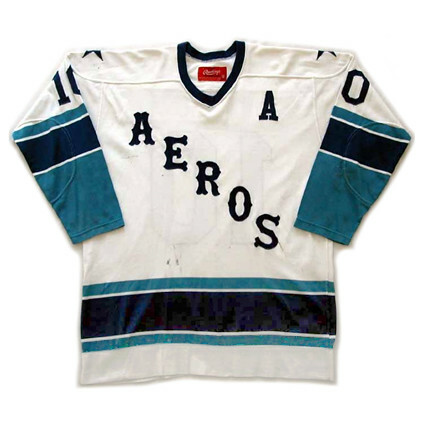 The Apollos simply recreated the familiar Aeros jerseys with the Apollos name in place of the Aeros, only with the addition of blue shoulders. 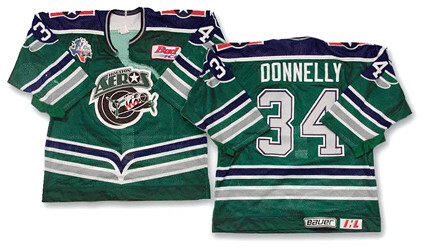 Today's featured IHL Aeros jersey is a 1995-96 Houston Aeros Gord Donnelly jersey as worn by the Aeros franchise in the International Hockey League. The new Aeros adopted the same name as the previous WHA franchise of the 1970s and produced these popular military themed jerseys. Note the large rip in the front of this jersey from the bottom of the v-neck collar and around the upper left side of the crest as the result of damage during a fight. 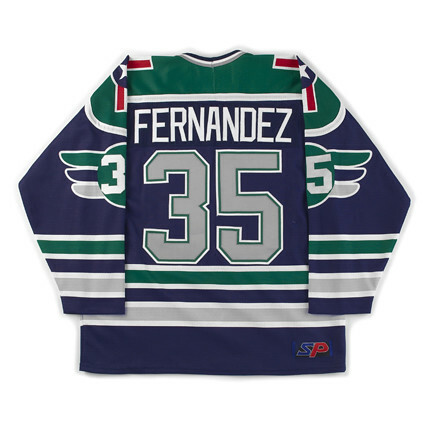 Bonus jersey: Today's bonus IHL Aeros jersey is a 1998-99 Houston Aeros Manny Fernandez jersey. 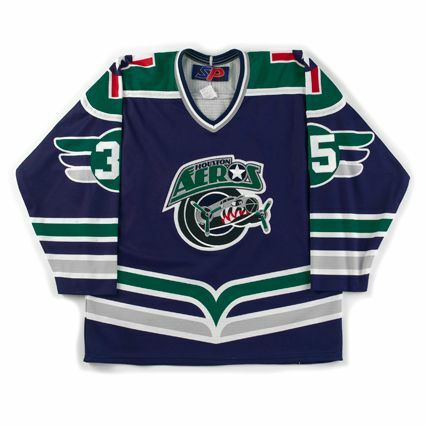 The Aeros made this style in both green and blue versions throughout their history. We are uncertain if the team ever wore both colors during the same season, using one as a primary and the other as an alternate, or replaced one color with the other. We have seen green jerseys dated from 1994-95 up to 1995-96 and blue jerseys said to be as old as 1997-98. As of now, we have been unable to find enough evidence to prove that both the green and blue jerseys were ever worn during the same season and would appreciate hearing from anyone with more definitive information about the timeline for both the green and blue versions. 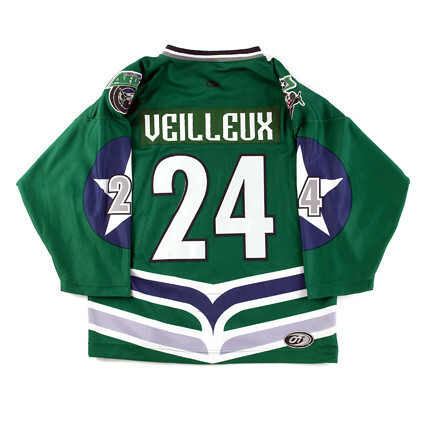 Today's featured AHL Aeros jersey is a 2001-02 Houston Aeros Stephane Veilleux jersey. 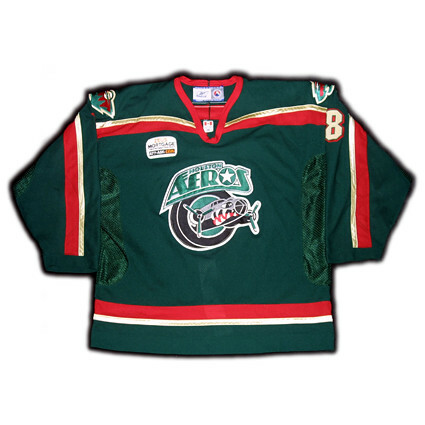 Minor league teams often create alternate or special occasion jerseys the Aeros were no different. 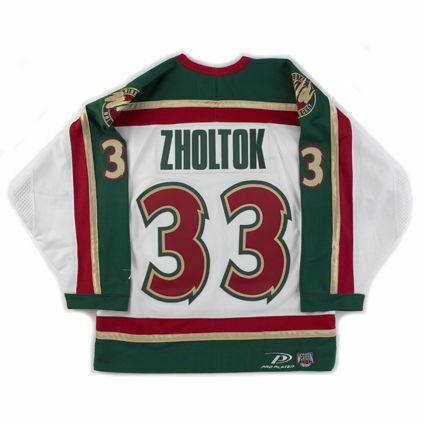 This alternate jersey was worn for the 2001-02 season, the first as the top minor league affiliate of the Minnesota Wild. This style promotes the "A" from their wordmark to the primary logo, with the bomber logo used as the secondary shoulder logos on this rarely seen style. 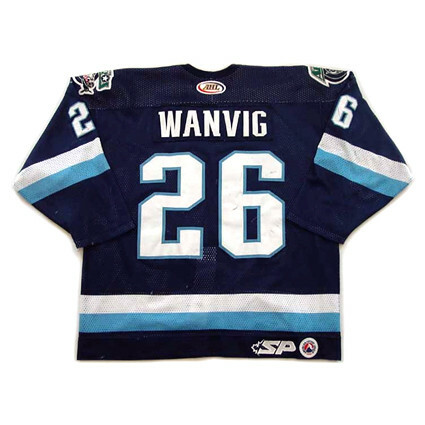 Bonus jersey: Today's bonus AHL Aeros jersey is a 2003-04 Houston Aeros Kyle Wanvig jersey. 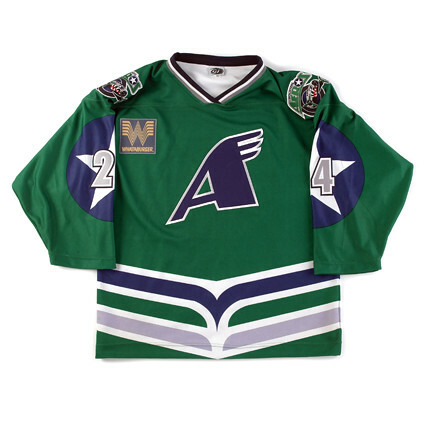 The Aeros created this wonderful modern take on their old WHA jerseys for their 10th Anniversary season of 2003-04. The 10th Anniversary patch was also the introduction of their new, modern jet fighter logo. 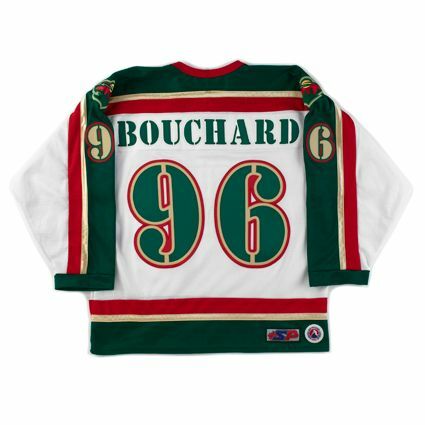 Extra bonus jersey: Today's extra bonus AHL Aeros jersey is a 2004-05 Houston Aeros Pierre-Marc Bouchard jersey. 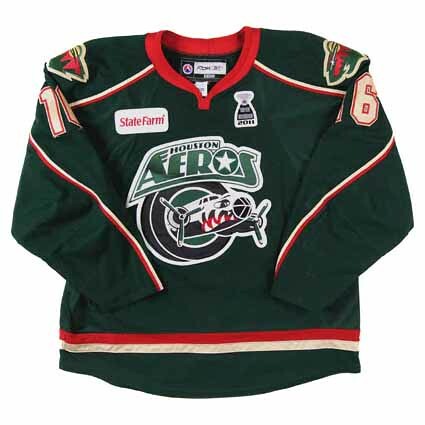 This was the first season for this jersey style, as the Aeros were purchased by their parent club, the Minnesota Wild, who proceeded to dress the Aeros in the Wild's basic jersey template, replacing the modern version of the WHA Aeros jerseys. 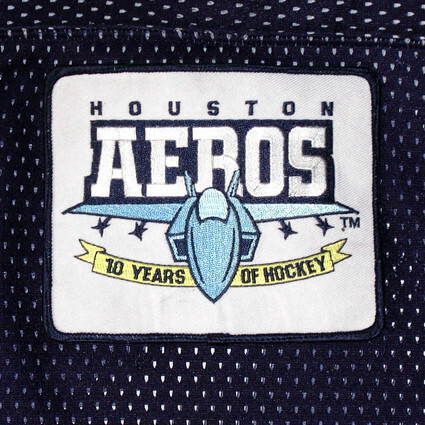 Also proving quite unpopular with the Aeros fanbase was the complete elimination of the classic Aeros bomber logo, which was replaced by the modern jet fighter logo, first introduced the previous season in a steely blue color on their 10th Anniversary patch as seen above. 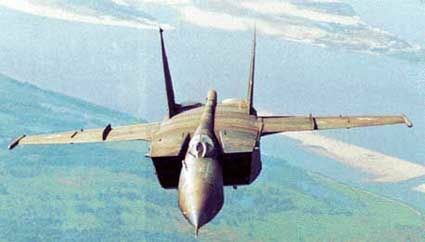 The conversion of the jet to the Iron Range Red color of the Wild in 2004-05 only made matters worse, as the illustration of the jet looked enough like a Russian MiG-25 with it's square air inlets to begin with, but now rendered in a decidedly communist red color made the elimination of the original bomber logo from the jerseys completely unacceptable to the die hard Houston fans. 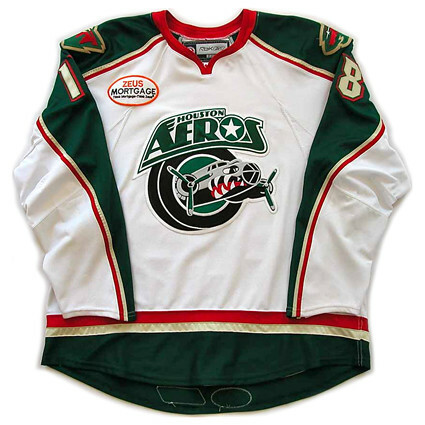 The Aeros used today's extra bonus AHL Aeros jersey for the 2004-05 and 2005-06 seasons. When the Aeros first changed over to the Minnesota Wild's jersey colors and template, despite the logo controversy, they did select a fantastic military-inspired stencil font for the names and numbers that set it apart from the parent club's furry numbers and in the process, brought the military theme back to the Aeros jerseys not seen since their beloved classic jerseys, last used in 2002-03. 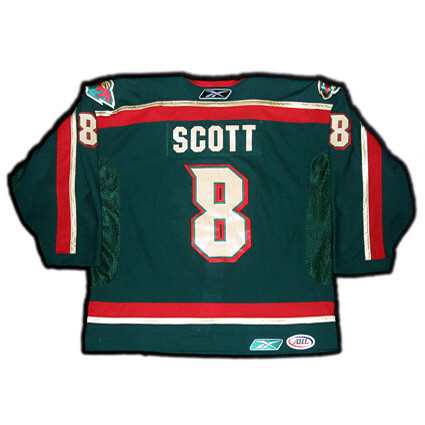 Extra extra bonus jersey: Today's extra extra bonus AHL Aeros jersey is a 2006-07 Houston Aeros John Scott jersey. After the outcry over the modern jet fighter logo, particularly the red and green version, the Aeros brought back the original bomber logo, only now with the former blue elements changed to green, yet still paired with the Wild's jersey template used since 2004-05. While the team reverted to their 1994-95 to 2003-04 logo, the team retained the jersey of their parent club the Wild and unfortunately dropped their stencil font for the names and numbers, changing instead to the block font used by their parent club in Minnesota, only with small serifs in the upper left corners to give the numbers a faster appearance. 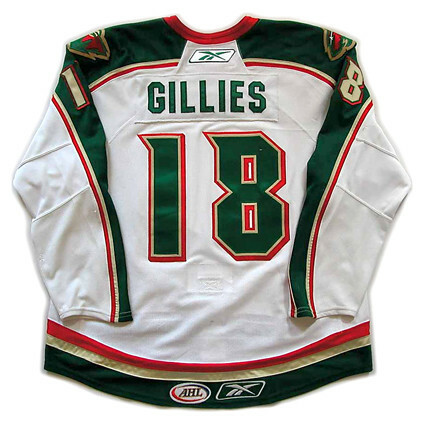 Extra extra extra bonus jersey: Today's extra extra extra bonus AHL Aeros jersey is a 2007-08 Houston Aeros Colton Gillies jersey. For the 2007-08, AHL jersey supplier Reebok introduced their Edge Jersey System to the league's jerseys, which resulted in a jersey similar to the previous generation, but with the notably narrower trim stripes down the arms and the curved, "shirt tail" hemline at the bottom. 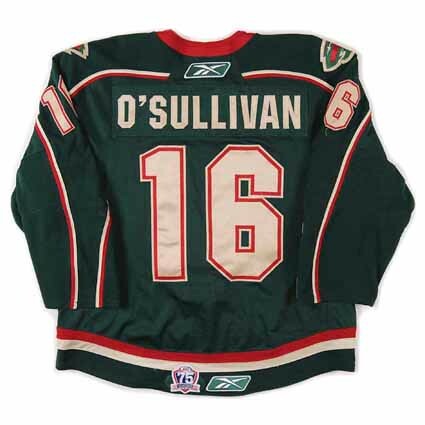 Extra extra extra extra bonus jersey: Today's extra extra extra extra bonus AHL Aeros jersey is a 2010-11 Houston Aeros Patrick O'Sullivan jersey. This was the last season for the Aeros to use the Minnesota striping template, only now with the "speed serifs" removed from the numbers, which were now a standard block font. This jersey also features the Calder Cup Finals patch from the Aeros last appearance in the championship round in 2011. 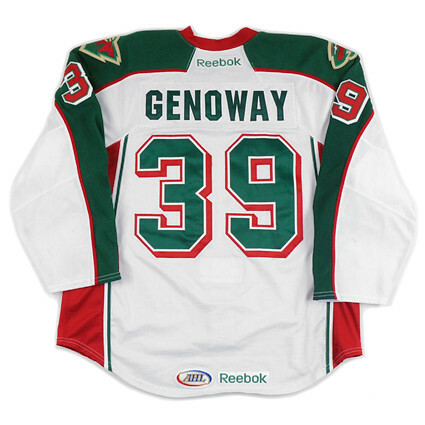 Extra extra extra extra extra bonus jersey: Today's extra extra extra extra extra bonus AHL Aeros jersey is a 2011-12 Houston Aeros Chay Genoway jersey. 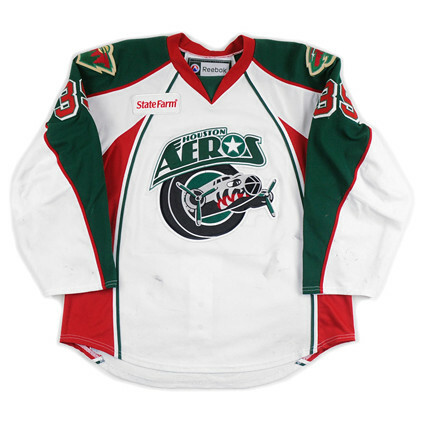 The final incarnation of Aeros jerseys arrived in 2011-12 for their final two seasons in Houston. Rather than a continuation of the Wild's jersey template, the Aeros got an entirely new jersey of their own, albeit still in the colors of the Wild. Today's video section has plenty of great footage and begins with a thoughtful Gordie discussing playing with his sons at the age of 50. Next, a look at Howe and some of the hard hits and successes he had with the Houston Aeros, including rare footage of him with the Avco World Trophy. Next is the Aeros of the IHL reaching the pinnacle by winning the 1999 Turner Cup championship. Finally, extended highlights of the Aeros, now members of the AHL, winning the 2003 Calder Cup championship. Thanks for posting this. I played in the hockey in the Houston from 1972 to 1975. That was in the Metropolitan Houston Hockey Association (MHHA). Once season I played on the same line as Peter Dineen , son of Aeros coach Bill Dineen and also played plenty of games against Kevin Dineen who made it to the NHL and still active as an assistant coach with the Chicago Blackhawks. I would love to find records of the minor league hockey scene in Houston from those days. We welcome and encourage genuine comments and corrections from our readers. Please no spam. It will not be approved and never seen. "Sweater" for all my Canadian friends! Welcome to our end of the rink. Bienvenue sur notre bout de la patinoire. So why "Third String Goalie"? It's defined as "A fan who sits in the stands wearing a jersey." 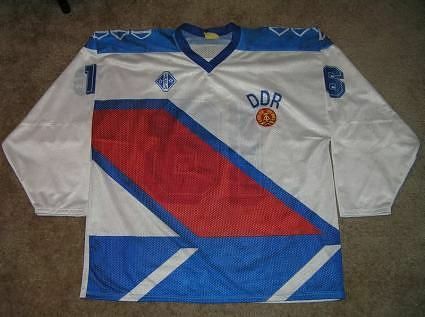 Our aim is to feature a different jersey each day from a historical perspective. 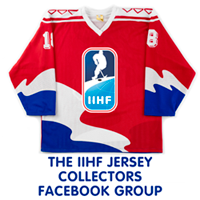 Stay tuned and hopefully you'll see some jerseys of interest or perhaps some that you haven't seen before and learn a bit of hockey history along the way. In addition to our articles, be sure to scroll down this column and explore the other fun and informative features of this blog. One final thing -never, ever tuck your jersey into your pants. Looking to reach our loyal readers with your hockey related product or service? Of our hundreds of readers each day, 60% are located in the United States and 30% come from Canada. Our audience is your audience and you can target them now with our reasonable ad rates. We've been linked to by SI.com, ESPN.com, Uni-Watch.com, NBCSports.com and the Yahoo! Sports Puck Daddy blog among others. Contact us today for more information at: Spyboy1@gmail.com! There is no limitation to what kind of hockey jersey it can be - replica, authentic or game worn jersey from the NHL, a national team, the minors, juniors, college, high school or even your pond hockey jersey. Feel free to write a paragraph or two about the jersey telling us why you like the jersey, how you got it, what makes it special to you or even a full-blown Third String Goalie-style history lesson - whatever you feel like sharing. Visting from outside North America? Just select your preferred language and Third String Goalie will be instantly converted to your language of choice! Click the names to see sample photos of the jerseys. the Third String GoalieHockey Name Generator! 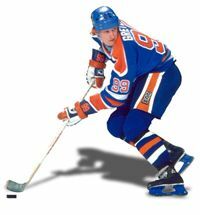 the Third String GoalieWayne Gretzky Fact of the Day Blog!